Gerald Paul Carr (born August 22, 1932), (Col, USMC, Ret. ), is an American mechanical and aeronautical engineer, former United States Marine Corps officer, naval aviator, and former NASA astronaut. He was Commander of Skylab 4, the third and final manned visit to the Skylab Orbital Workshop, from November 16, 1973 to February 8, 1974. Carr was born in Denver, Colorado on August 22, 1932, but was raised in Santa Ana, California, which he considers his home town. He graduated from Santa Ana High School in Santa Ana in 1950, where he played varsity football and was president of the honor society and bachelor's club. Carr received a Bachelor of Science degree in mechanical engineering from the University of Southern California in 1954. He spent five years flying fighter jets, then returned to school. He earned a degree in aeronautical engineering from the U.S. Naval Postgraduate School in 1961, and a Master of Science degree in aeronautical engineering from Princeton University in 1962. Carr married his high-school sweetheart, Joann Ruth Petrie. They had two sets of twins and six children total. They divorced and his second marriage was to Patricia Musick in 1979. Carr began his military service with the U.S. Navy, and in 1950 he was appointed a Midshipman with the Naval Reserve Officer Training Corps (NROTC) detachment at the University of Southern California. Upon graduation in 1954, he received his commission in the U.S. Marine Corps and subsequently reported to The Basic School at Marine Corps Base Quantico, Virginia. He received flight training at Naval Air Station Pensacola, Florida, and Naval Air Station Kingsville, Texas, and was then assigned to VMF(AW)-114 where he gained experience in the F9F Cougar and the F-6A Skyray. After postgraduate training, he served with VMFA(AW)-122, from 1962 to 1965, piloting the F-8 Crusader in the United States and the Far East. Other aircraft he has flown include the F-4, T-1A, T-28, T-33, T-38, H-13, and ground effect machines. Carr was one of the 19 astronauts selected by NASA in April 1966. When informed by NASA of his selection for astronaut training, he was assigned to the test directors section of Marine Air Control Squadron 3, a unit responsible for the testing and evaluation of the Marine Tactical Data System. He served as a member of the astronaut support crews and as CAPCOM for the Apollo 8 and 12 flights, and was involved in the development and testing of the Lunar Roving Vehicle. He was in the likely crew rotation position to serve as lunar module pilot for Apollo 19 before this mission was canceled by NASA in 1970. Carr was commander of Skylab 4 (third and final manned visit to the Skylab Orbital Workshop) launched November 16, 1973 with splashdown on February 8, 1974. He was the first rookie astronaut to command a mission since Neil Armstrong on Gemini 8 and was accompanied on the record-setting 34.5-million-mile flight by Science Pilot Dr. Edward Gibson and Pilot WilliamPogue. The crew successfully completed 56 experiments, 26 science demonstrations, 15 subsystem-detailed objectives, and 13 student investigations during their 1,214 orbits of the Earth. They also acquired extensive Earth resources observation data using hand-held cameras and Skylab's Earth Resources Experiment Package camera and sensor array. They logged 338 hours of operations of the Apollo Telescope Mount, which made extensive observations of the sun's solar processes. From February 1974 until March 1978, Carr and his Skylab 4 teammates shared the world record for individual time in space: 2,017 hours 15 minutes 32 seconds, and Carr logged 15 hours and 51 minute in three EVAs outside the Orbital Workshop. In mid-1977, Carr was named head of the design support group within the Astronaut Office responsible for providing crew support to such activities as space transportation system design, simulations, testing, and safety assessment, and for development of man/machine interface requirements. Carr retired from the U.S. Marine Corps in September 1975 and from NASA in June 1977. We would never work 16 hours a day for 84 straight days on the ground, and we should not be expected to do it here in space. Jerry Carr to NASA, just before the crew went on strike. On December 28, 1973, the crew of Skylab 4 shut off the radio and took the day off, floating around, enjoying space, and taking photos of Earth. They were protesting against micromanagement, employer spying, and long hours. Thus, the crew was involved in the first labor strike to occur in space. Carr started his post-NASA career as manager of corporate development at Bovay Engineers, Inc., a Houston engineering consulting firm. He later became a senior vice president, leaving the firm in 1981. He was a senior consultant on special staff to the President of Applied Research, Inc., Los Angeles, California from 1981 to 1983. From 1983 until 1985 Carr was manager of The University of Texas 300-inch (7.6 m) Telescope Project. Carr founded CAMUS, Inc. in 1984 based in Vermont. The family-owned corporation provides technical support services in zero-gravity human factors engineering, procedures development, operations analysis, training and systems integration. CAMUS was a major contributor as a technical support subcontractor to Boeing in the crew systems design of the International Space Station. In addition, the corporation is involved in fine art production designed by Carr's wife, artist and sculptor Pat Musick. Carr is a former director of the Sunsat Energy Council; a former director of the Houston Pops Orchestra; a director of the National Space Society. He was presented with an honorary Doctorate of Science in aeronautical engineering from Parks College of Saint Louis University, Cahokia, Illinois, in 1976. He was awarded the National Defense Service Medal; Armed Forces Expeditionary Medal; Marine Corps Expeditionary Medal, and a Letter of Commendation from the Commander of Carrier Division Two. Navy Distinguished Service Medal and the Navy Astronaut Wings; 1974; University of Southern California Alumni Merit Award, 1974; Boy Scouts of America Distinguished Eagle Scout Award, 1974; Marine Corps Aviation Association's Exceptional Achievement Award, 1974. Carr was awarded the 1974 FAI Gold Space Medal. He received the City of New York and City of Chicago Gold Medals for 1974. Carr was one of 24 Apollo astronauts who were inducted into the U.S. Astronaut Hall of Fame in 1997. The three Skylab astronaut crews were awarded the 1973 Robert J. Collier Trophy "For proving beyond question the value of man in future explorations of space and the production of data of benefit to all the people on Earth." In 1974, President Nixon presented the Skylab 4 crew with the NASA Distinguished Service Medal. Federation Aeronautique Internationale awarded the Skylab 4 crew the De La Vaulx Medal and V. M. Komarov Diploma for 1974. The American Astronautical Society's 1975 Flight Achievement Award was awarded to the Skylab 4 crew. Carr accepted the 1975 Dr. Robert H. Goddard Memorial Trophy from President Ford, awarded to the Skylab astronauts. The Skylab 4 crew won the AIAA Haley Astronautics Award in 1975 "For demonstrated outstanding courage and skill during their record-breaking 84-day Skylab mission". In 1974, Gerald P. Carr Intermediate School (previously Ralph C. Smedley Junior High) in Santa Ana, California, was renamed in Carr's honor, and the school's team name is the Astros, in honor of Carr's NASA achievements. ^ a b c d e f g h i j k l "Gerald Carr Biography". NASA. October 2003. Retrieved February 18, 2019. ^ a b Grant, Gordon (January 20, 1972). "'Strangers' to Meet in Skylab". Los Angeles Times. Los Angeles, California. p. 9 – via Newspapers.com. ^ a b "In Charge of Longest Space Flight". Mexico Ledger. Mexico, Missouri. Associated Press. November 16, 1973. p. 4 – via Newspapers.com. ^ a b Recer, Paul (November 19, 1973). "One Factor Common to All—Space Rookies". The Leader-Post. Regina, Saskatchewan. p. 11 – via Newspapers.com. ^ Orloff, Richard W. (June 2004) . "Apollo by the Numbers: A Statistical Guide". NASA. SP-4029. ^ "Apollo 18 through 20 - The Cancelled Missions". NSSDC. Retrieved February 16, 2019. ^ "Skylab Astronauts Return Home Safely". The Winona Daily News. Winona, Minnesota. Associated Press. February 8, 1974. p. 1 – via Newspapers.com. ^ "Skylab Crewman Have Personal Goals". Tucson Daily Citizen. Tucson, Arizona. Enterprise News Service. November 7, 1973. p. 36 – via Newspapers.com. ^ "All-Rookie Crew Doesn't Bother Skylab Commander". The Greenville News. Greenville, South Carolina. Associated Press. November 6, 1973. p. 30 – via Newspapers.com. ^ Ramsay, Jim (April 22, 1977). "City Officials Hear Astronaut Describe Plans". Valley Morning Star. Harlingen, Texas. p. 1 – via Newspapers.com. 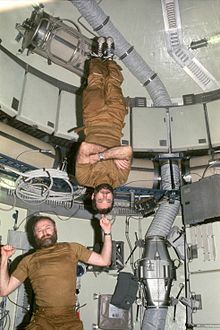 ^ "Skylab Astronauts End Careers in the Military". Lancaster Eagle-Gazette. Lancaster, Ohio. September 9, 1975. p. 17 – via Newspapers.com. ^ "Russians End 96-Day Stay in Space Station". Tulare Advance-Register. Tulare, California. UPI. March 16, 1978. p. 7 – via Newspapers.com. ^ Lee Ellis. Who's who of NASA astronauts. p. 234. ^ "Astronauts Pogue, Carr Retire". The Indiana Gazette. Indiana, Pennsylvania. August 25, 1975. p. 23 – via Newspapers.com. ^ a b "Carr, Space Record Holder, Quits NASA". The Tampa Tribune. Tampa, Florida. Associated Press. June 23, 1977. p. 42 – via Newspapers.com. ^ a b "The day when three NASA astronauts staged a strike in space". Los Angeles Times. Retrieved January 6, 2019. ^ "Astronaut to Address Grads". The Edwardsville Intelligencer. Edwardsville, Illinois. August 2, 1976. p. 3 – via Newspapers.com. ^ "Astronaut to Address USC Alumni". Valley News. Valley Nuys, California. March 17, 1974. p. 28 – via Newspapers.com. ^ Cowan, Cliff (September 22, 1975). "World's Fliers Drop Into Ottawa". The Ottawa Journal. Ottawa, Ontario. p. 3 – via Newspapers.com. ^ "Collier 1970–1979 Recipients". National Aeronautic Association. Retrieved February 9, 2019. ^ "NASA Fund Drive Backed by Nixon". Playground Daily News. Fort Walton Beach, Florida. UPI. March 21, 1974. p. 2 – via Newspapers.com. ^ "FAI Awards". FÉDÉRATION AÉRONAUTIQUE INTERNATIONALE. Retrieved February 13, 2019. ^ "Former Astronaut to Speak Friday". The Tennessean. June 29, 1983. p. 52 – via Newspapers.com. ^ "Neil Armstrong Space Flight Achievement Award". American Astronautical Society. Retrieved February 13, 2019. ^ "Haley Space Flight Award". AIAA. Retrieved February 12, 2019. ^ "Smedley School Renamed For Astronaut". Santa Ana Register. July 11, 1974. p. 5 – via Newspaperarchive. Wikimedia Commons has media related to Gerald P. Carr. This page was last edited on 15 April 2019, at 17:27 (UTC).